Never get caught in the dark again with your new MAXSA Innovations Battery-Powered Motion-Activated SMT LED Wall Sconce. 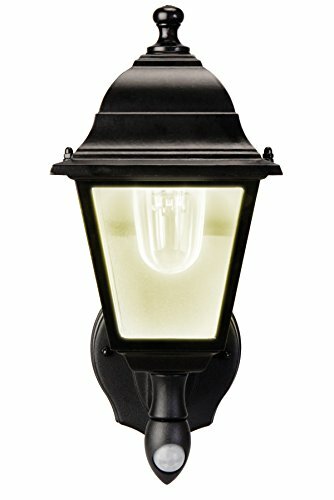 This beautiful and classically designed piece looks as good in the daytime as it does at night, and it can be mounted anywhere bright light is needed. There is no need for an electrical outlet. The durable, weatherproof housing is accented by real glass panels and a mirrored rear reflector that increases the apparent brightness of the bulbs. The motion activated function helps to dissuade intruders on your property at night, while providing convenient lighting for you as well. To top it off, installation is easy! Simply identify the perfect location to mount the light. Then, use the included hardware to attach the back cover to the chosen surface. Once the light is set up, a simple movement will activate the light, and 5 super-bright LEDs will turn night into day! The light will continue to stay on as long as there is motion. The long-life LEDs last for over 30,000 hours (45 years)! Built for easy installation, unobtrusive size, and no maintenance, this sturdy wall sconce will be a beautiful addition to your home. Requires 4 C batteries, not included. If you have any questions about this product by Maxsa Innovations, contact us by completing and submitting the form below. If you are looking for a specif part number, please include it with your message.